With a few clicks of the mouse, Tidewater Community College students can check their accounts and pay tuition, all while avoiding lengthy lines and wait times. Students can also designate a payer, a parent or guardian, to make the process even easier. 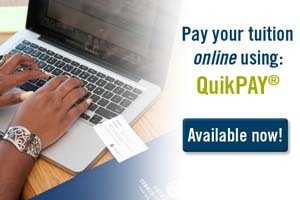 Tuition payments can be made with VISA and MasterCard or by eCheck using a checking or savings account. Students can opt to receive emails or text messages to confirm payments. The deadline for fall tuition payments is Aug. 9. For more information, contact your campus business manager or TCC’s Information Center at 757-822-1122.